Lively. Tireless. Active. Fierce. Excited. The vehicle design team at ROUSH Performance continues to build on their theme of DETROIT MUSCLE | REDEFINED by launching a limited quantity of ROUSH Stage 3 (RS3) Mustangs aptly defined as the Hyper-Series. The 2012 ROUSH Stage 3 Mustang is powered by a 50-state legal TVS 2.3L ROUSHcharger® system that delivers over 540HP and 465 ft/lbs of torque. The powertrain works in concert with the ROUSH-calibrated suspension that lowers the Mustang by almost an inch, and enables the vehicle to pull over 1G of lateral force on a dry skid pad. The ROUSH-tuned performance exhaust delivers a throaty growl that let's everyone know that you're piloting some Detroit Muscle. The Hyper-Series builds on the ROUSH Stage 3's horsepower and handling by offering a set of four limited edition appearance packages. "The 2012 RS3 Mustang has been a big hit with our customers and enthusiasts. Not just because of the RS3's power and handling performance, but also because of the 288 graphics and paint color combinations that can be selected," says Gary Jurick, VP and General Manager of ROUSH Performance. "The Hyper-Series introduces four spectacular and unique graphics and interior colors that provide a customized appearance to the RS3." Each 2012 RS3 Hyper-Series Mustang comes standard with black body paint as the base. The Hyper-Series palette includes these four color options: "Mat It Mango", "Gas It Green", "Punch It Purple", and "Launch It Lemon". 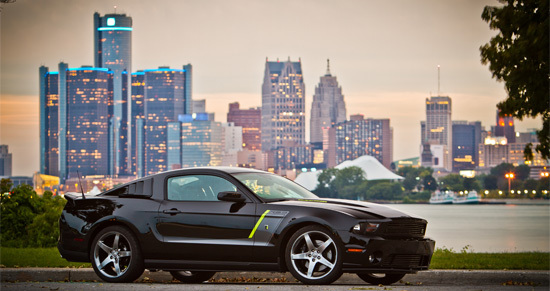 For the 2012 model year, ROUSH Performance will only build twenty-five vehicles of each color. Vehicles will be serialized as ROUSH certified builds, and will be numbered as per their production spot for each Hyper-Series color (ie: "Vehicle #12 of 25 – Mat It Mango"). "The materials used in the Hyper-Series graphics really allow these unique colors to pop and dance in the changing sunlight," continues Gary Jurick. "The primary graphic color is hyper black, to compliment the hyper black wheels, and then the graphics accent stripe appears in the selected Hyper-Series color." This color is then applied to the exterior graphics, badges, and rear faux gas cap. The dynamic accent color also carries through the interior on the suede door panels, leather seating, and the shift boot stitching. Each 2012 RS3 Hyper-Series Mustang comes with two shifter balls that are easily swapped out depending on the mood of the driver. "The Hyper-Series shifter ball color really 'pops' as you view the interior of one of these Hyper-Series RS3's!" says Jurick. "We decided to include a second shifter ball that’s a bit more conservative, if preferred." The 2012 RS3 Hyper-Series includes a suede-wrapped steering wheel to add a comfortable feel while driving a performance car. Finally, each new RS3 Hyper-Series owner will receive a unique accessories package including ROUSH apparel and display items to commemorate their serialized Hyper-Series vehicle. The Hyper-Series RS3 is covered by a 3-year/36,000-mile warranty and is currently available with a 6-speed manual transmission only.